Studies for an equestrian monument, seen in profile to the right; showing different attitudes for the horse and rider, and different bases. The mercenary commander Gian Giacomo Trivulzio (1440/41-1518) led the French forces in the invasion of Milan in 1499. Some ten years before his death, he seems to have commissioned Leonardo to design an equestrian monument that would serve as his tomb. 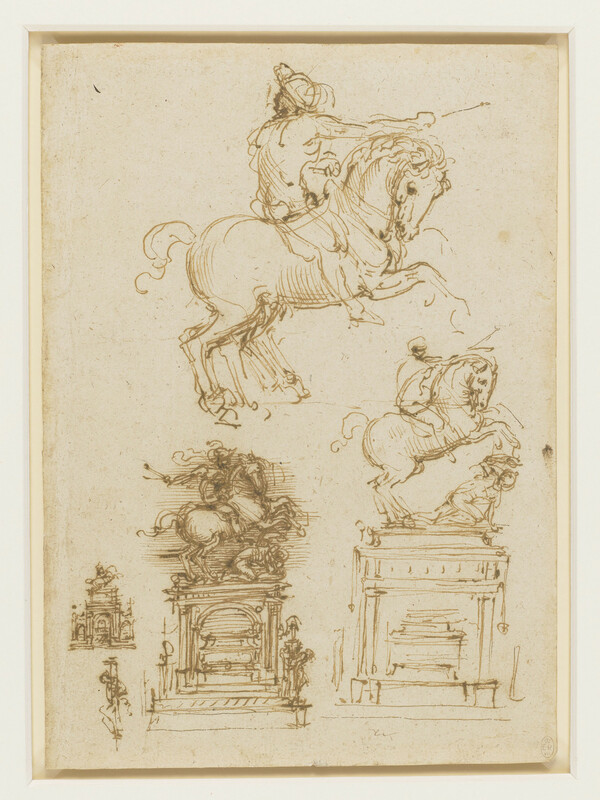 Leonardo made a number of variant sketches and prepared a detailed costing for a life-size bronze horse and rider on a marble base containing a sarcophagus. There is no evidence that Leonardo began any physical work on the project.